I have mentioned in previous reviews for films that delved into religious themes that such things aren't of importance to my life, yet I find them fascinating when explored in cinema. I rarely will choose to enter a place of worship during my own free time, yet when one is the setting of a movie I am often times in awe of the imagery and envious of the power that comes with a strong belief in a God. During the first act of Ingmar Bergman's Winter Light, we see a handful of people in attendance of a church service and I was instantly sucked into their world, as if I was sitting in a nearby pew. The thing is, I can't recall what was actually said during this sequence. I'm not even sure if I absorbed the words while I was screening the film, but it didn't matter. I couldn't take my eyes off of the faces of the people listening to the sermon, as their reactions to the message, whether a subtle feeling of regret lingering behind their expressions or a not so subtle pain flooding rapidly to the surface, were far more captivating and cinematic than the message itself. While the narrative of Winter Light obviously revolves around religion, I actually found that the story centers far more on the nature of humanity, the people that occupy our living world rather than the higher spiritual realm they strive to understand for comfort. Tomas (Gunnar Bjornstrand) is the Pastor of the church, a position that has him literally standing in front of and above the congregation as he delivers the message of a lord, a savior, and yet rarely throughout the film does he actually speak. When he does, his words aren't powerful or meaningful or influential, quite the opposite actually. No matter what Tomas says, it doesn't bring comfort to others nor himself. Jonas (Max Von Sydow) is a troubled soul, a man who has reached a breaking point in life, haunted by the idea of a literal nuclear holocaust. He and his wife reach out to Tomas for help, for words of guidance and comfort that could perhaps alleviate his fears and bring a sense of normalcy back to their lives, but how could a Pastor who feels no connection to God himself, a man who believes he has failed with his chosen path through life, assist in straightening out the soul of another? Winter Light is one of those pictures that I find is impossible to pick up on every nuance or peel back every thematic layer with only one viewing. 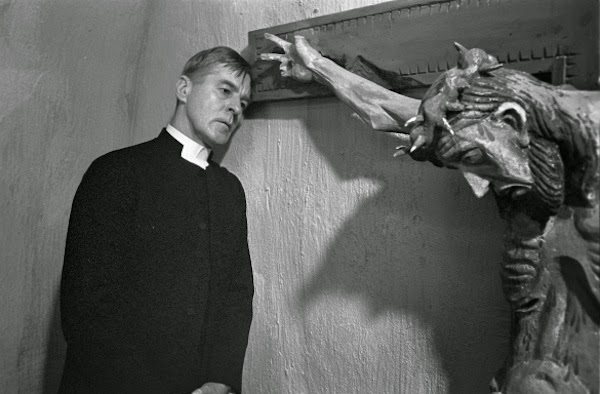 For example, there is a particular scene that I keep playing back in my mind since I finished the film early this morning in which Tomas and a man named Algot (Allan Edwall) are having a discussion about the suffering of Christ and the fact that Algot believes the emphasis being on the physical pain Jesus felt is misguided. Algot points to the fact that after being betrayed, Christ cried out to a father, a God that had suddenly become silent at a time when he needed him most. While not literally comparable in importance, is this perhaps also the case for Tomas as well? Throughout the film it is made evident that he is under the weather, clearly experience physical discomfort, and the focus on his suffering resolves around the loss of his wife years earlier. Perhaps the real reason Tomas suffers, the real source of his deeper pain, is that beneath the surface he is crying out for a god that is silent. 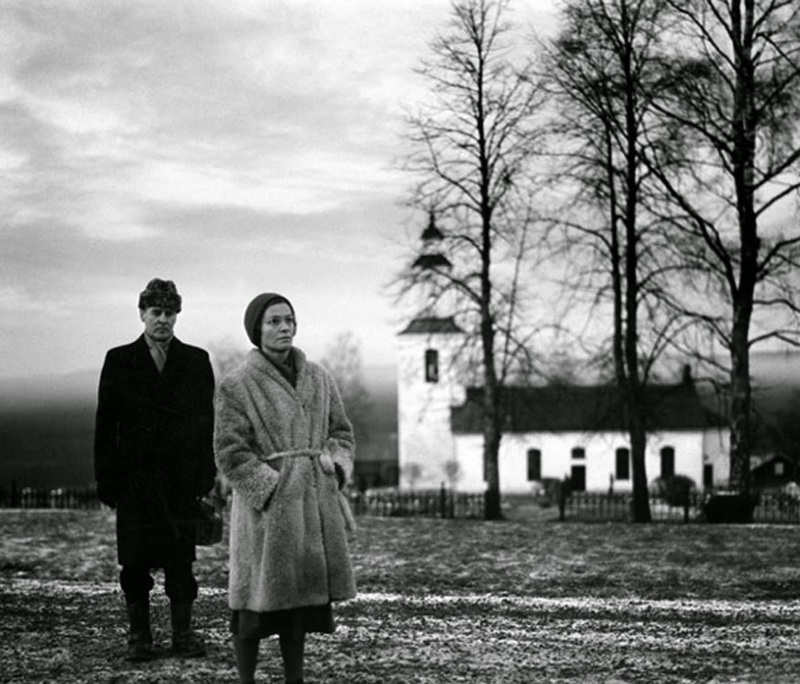 I have no knowledge of what Bergman himself believed in or whether or not religion played a role in his life, but Winter Light feels like a deeply personal work, a narrative that came from both the heart as well as an endlessly creative mind. Perhaps Ingmar Bergman was in search of a silent god. This one looks amazing. I must see it. Thanks Arion, I will check that out. Appreciate the kind words!